We sell a number of products in our shop but the vast amount of our sales occur online. Instead of retailing directly though our physical storefront though, our online sales are typically facilitated through affiliate relationships with other merchants and sellers. To learn more about how this happens you can take a look at our disclosures linked in the footer. 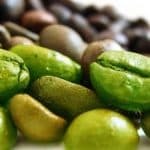 In addition to educating our customers on all things coffee, we also compare various products that our customers are trying to decide between. These comparisons are an integral part of the process of our business. Additionally we curate very specific types of products that our customers are looking for and make recommendations along the way. Below you can see the general categories for our online shop and all the various curated pages within that given category. 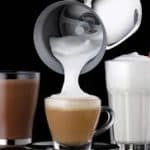 There are a lot of different Nespresso machines and they all make great espresso so we’ve prepared this gigantic, comprehensive article for the purpose of comparing all the important things that differentiate the Nespresso machines. 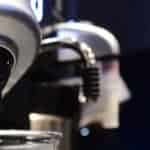 These machines are pod-style espresso machines so they work different than standard espresso machines and are worth a look as a stand-alone style of making coffee. If you think Keurig coffee forever then you may likewise see Nespresso as the paradigm shift currently happening in the espresso side of the market. The stovetop espresso maker makes a potent coffee that is served much like espresso in 1.5 to 3 ounce servings. The pot brews coffee under low pressure (1.5 bars) called moka which can replace true espresso in many espresso based drinks. 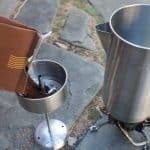 Moka pots require a heat source from a stovetop or an open flame and they have no moving or mechanical parts. They are simple coffee makers that everyone should have for a whole host of reasons. 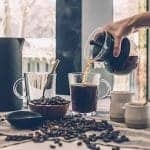 There are so many different types of drip coffee makers on the market and they can range in price by hundreds of dollars. Some of the cheapest drip coffee makers can be had for less than $20 while you can easily pay $400 or more for one! We understand that most people will have budgets that fall somewhere in the middle and some will want single serve pod-based coffee makers while others want their machine to have a standard grind basket. We have structured our site to provide commentary, reviews, and recommendations to all people. To do that we section products out by style, features, and pricing to better serve our customers. No matter what drip coffee maker is best for you you will be able to find it here. 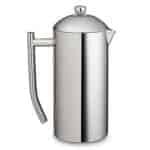 Coffee urns are the easiest way for individuals or small business to make bulk coffee for small, medium, to large groups of people. Most coffee urns make coffee just like an electric percolator so the coffee isn’t fancy but it’s way better than making new pots over and over and over during your functions. We are firm believers that everyone should own one or two french press coffee makers. 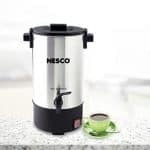 There are so many different kinds and they are so affordable on the low end that you should own one even if you don’t make coffee very often as they can be very useful to have in the kitchen. Here are our favorites and our reviews of the best coffee presses sold today. People all across the world made coffee in a percolator throughout most of the 20th century. In those days most percolators were stovetop models that sat directly on the heat source. They worked just fine but they weren’t all that great at limiting grind spill, avoiding over-extracting, and keeping temperatures in a healthy coffee brewing “zone”. These days there are better stovetop/camping percolators as well as really awesome electric models. Here is our list of favorites. 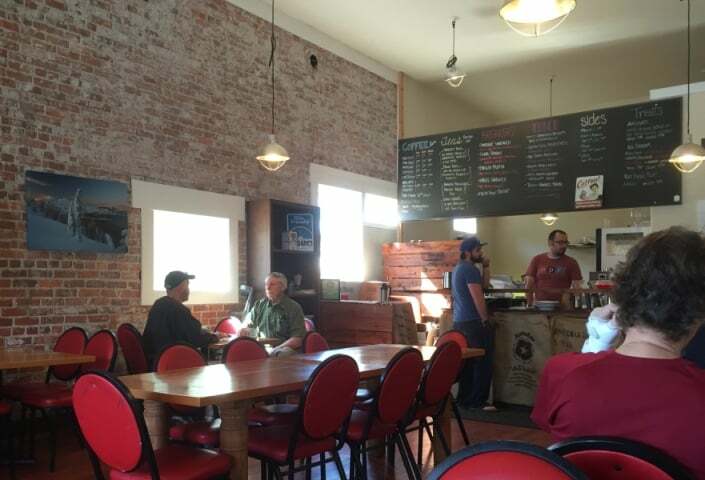 Pour over coffee is like a single serving version of drip coffee – the difference however is that the person making the coffee has full control over all the variables. You control the water temperature, the blooming of grind, the speed of the pour and the volume you make. In short you can always make better coffee with a pour over device if you want to and it’s the ultimate single serve brewer. There are of course a ton of coffee drippers and pour over coffee makers so we can help you as you narrow down your search. If you know anything about coffee you know that cold brew coffee is very different from iced coffee and unless you want to DIY it with buckets and cheesecloth having a dedicated cold brew coffee maker can make things a lot more professional in the kitchen. There are a number of different cold brew coffee makers though, some of which are better than others. Check here for our thoughts on the products available. 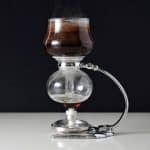 For the true coffee geeks of the world there are siphon coffee makers which all look like they came out of a lab somewhere. They look like you are conducting experiments on coffee itself. Instead siphon coffee makers work a bit like big glass moka pots. The heat source on the bottom creates a vacuum effect raising the water a brewing the coffee almost in reverse. 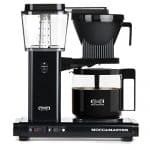 These are the kind of products that you almost never see in stores and shopping online for your first vacuum coffee maker can seem pretty confusing so please check out our store pages on these interesting devices. A really, really good cup of coffee requires three basic things: fresh beans, ground consistently, and brewed correctly. No matter how you prefer to make your coffee you will probably buy good beans and learn how to brew it correctly. You will however have to buy a top of the line coffee grinder if you want your cup of coffee to taste it’s best. 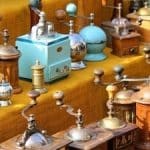 This page is essentially our buyers guide for high-end consumer grade electric burr coffee grinders. Do not buy a grinder without consulting our list. Electric burr grinders can be extremely expensive if you buy the best models. Although the best manual models are still more expensive than the cheapest electric grinders you can still buy the best manual grinder without breaking the bank. Here is our guide to the manual grinders which are surprisingly very good for their prices… you just have to bring some manual labor to the table. 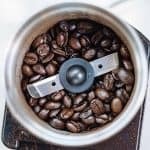 Blade grinders are frequently used for spices and small food processing jobs in the kitchen and they work in a pinch as a backup electric grinder for coffee. We do advice our price sensitive customers to go for blade grinders from time to time so if you are going to get one you might as well get the best since categorically they are so cheap. If you are an espresso enthusiast and operate an espresso machine in your home then you know how sensitive the quality of your coffee is to the consistency of the espresso grind you produce. 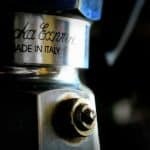 Most people start off with low end grinders which may be perfectly fine for drip-style coffee but to make the best espresso possible you really should get a dedicated grinder. 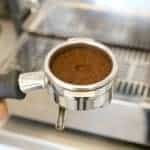 This page features our best advice on grinding coffee for espresso and reviews the best options for the home barista. 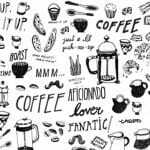 We have lots of different k-cup coffee pods that we like and we have written extensively on this site reviewing and curating k-cup single serve pods for our readers and customers. 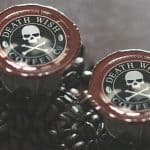 For a dedicated resource on selecting the perfect coffee for your K-cup coffee maker check this page out. 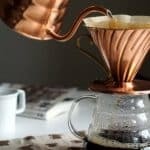 The Best Organic Coffee Brands Today! When making good coffee you have to start with awesome beans. You then grind it just before you brew and take great care to make the best coffee possible but if you do all this then why not go out of your way to make organic coffee in your own home by buying coffee from the best organic coffee companies out there. Here’s our run down of our favorites – did your favorites make the list? No matter how lazy you are there is no way around the fact that you have to deep clean your equipment from time to time. 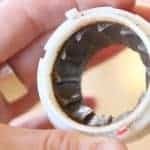 Most coffee appliances can be rinsed off under cold water after most uses but with coffee maker machines in particular you just can’t do that..ever. You may rinse your french press out after every use but the machine needs a good rinsing too. The water sits in lines and on the heating element for days and mineral deposits form along side the growth of bacteria. You can obviously run plain water cycles mixed with vinegar to help keep things sanitary but these dedicated cleaners and descalers are worth using from time to time because they work a bit better. Plain coffee drinkers may not need these items but if you make espresso or anything similar such as moka, Aeropress, or shots of Nespresso a good milk frother can make it really easy to make any mixed espresso drink. There are many frothers that are priced wildly different. Frothing wands being the cheapest and electric counter-top milk frothers being the most expensive. No matter what you want in your kitchen let us guide you as you shop, here. If you make tea or pour over coffee very often you no doubt understand how hard it can be to pour water from the boil out of a sauce pan into your cup! 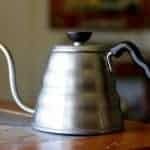 Tea kettles make this a lot easier but especially for brewing techniques that require a slow steady pour these specially designed pour over kettles cant be beat. Whether you are looking for something that sits on the stovetop or operates with electricity, we’re confident that these are the best options for you. We believe everyone should own at least one really nice travel mug. 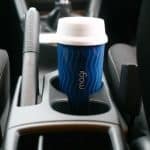 Cheap travel mugs can be had anywhere but they don’t perform well, are hard to keep clean, aren’t durable. We advise our customers to buy the best mug every time because they don’t cost a lot more and they won’t end up as clutter in the back of a kitchen cabinet. You can see our big selection of travel mugs, tumblers, and beverage bottles here. You may not think that having a dedicated set of espresso cups is necessary but once you start brewing or pouring your espresso, moka, Aeropress, or Nespresso servings into a regular size coffee mug you’ll understand why these are so nice to have in the coffee bar. Espresso mugs are sized appropriately for the amount of beverage you’ll be serving up and so they do better at retaining heat even when they are not insulated. Many of these small cups fit under spouts and dispensers whereas regular coffee cups won’t. Let’s also not forget that it just doesn’t feel right having a full sized coffee cup in your hand with only the bottom 20% of it full! 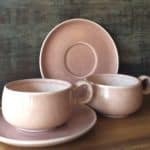 With that said, here are our favorite demitasse sets and small sized coffee cups for various espresso style drinks.